Qur’anic exegesis has become the battleground of political Islam and theological conflict among various Muslim schools of thought. Using comparative and contrastive methodology, examples from the Qur'an are investigated in the light of various theological views to delineate the birth, development and growth of Qur'anic exegesis. The political status quo, in the past and at present, has impinged upon Qur’anic exegesis more than on any other discipline in Islamic studies. This book illustrates the dichotomy between mainstream and non-mainstream Islam, showing how Qur’anic exegesis reflects the subtle dogmatic differences and political cleavages in Islamic thought. 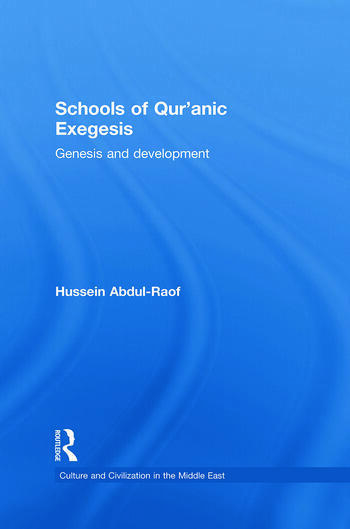 Chapters explore in depth the intrusive views of the compilers of early exegesis manuscripts, the scepticism among Western scholars about the authenticity of early Muslim works of exegesis and of prophetic tradition, and the role of exegesis as a tool to reaffirm the Qur’an as a canon. Written to appeal to those with comparative exegetical interests as well as those focused on Islamic studies in general, this book will be an important reference for research students, scholars, and students of Islamic Studies, Theology, Religious studies and Middle Eastern Studies. Hussein Abdul-Raof is Senior Lecturer in Arabic and Qur'anic Studies at the University of Leeds. His research interests include Arabic linguistics, Qur’anic studies, Arabic stylistics, Arabic rhetoric, and translation studies, and he has published widely on the Qur’an and Arabic rhetoric.